Sabudana Khichadi – The Way My Mom Makes it. 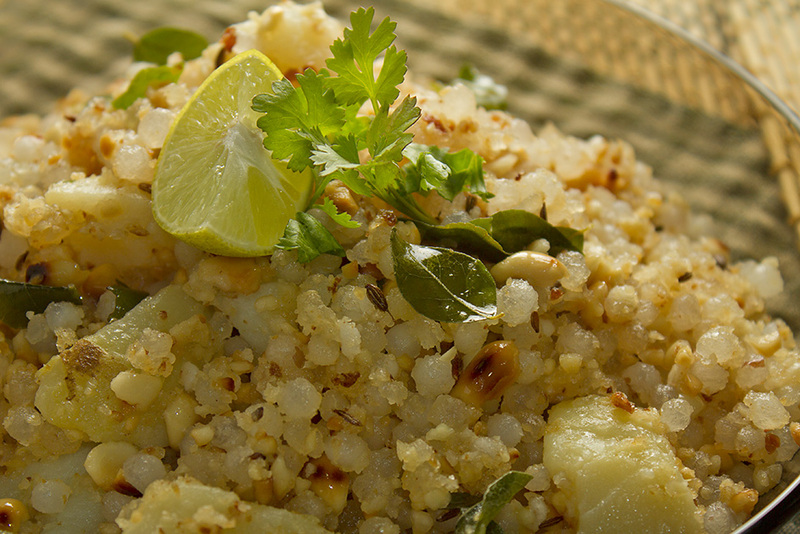 Sabudana Khichadi is typically served as ameal that you have when you are fasting. This is my mom’s recipe and she makes it to perfection. Till date every time the boys at home demand it, I have to ask mom to make it because I just can’t make it the way she does, despite following all her instructions. May be someday I will have to call her to look over my shoulder while I cook. So here’s Sabudana khichadi, the way mom says it is supposed to be made. Sabudana khichadi is an Indian dish made from soaked Sabudana (pearl tapioca). It is typically prepared in parts of Western India such as Gujarat, Madhya Pradesh, Rajasthan, & Maharashtra. In major towns like Mumbai, Pune, Indore, Bhopal and Nagpur, it is available as street food and is widely eaten throughout the year. It is the dish of choice when an individual observes a “fast” during Shivratri, Navratri, or a similar Hindu religious occasion. Pearl tapioca (Sabudana) is soaked for a while and is then fried with cumin seeds, salt, red chili powder, green chilies and other optional ingredients such as fried peanuts. It is usually garnished with coriander leaves. Sago is nearly pure carbohydrate and has very little protein, vitamins, or minerals. The addition of Peanuts to Sabudana Khichadi adds to the protein content, making it a more balanced meal. It has a high calorific content, due to the quantity of starch and fat present. Potatoes 2 medium sized ones. Wash Sabudana, add quarter cup water and keep it overnight or for 4-5 hours. Just before you are ready to cook, drain the excess water (if any) from the sabudana very well and keep it aside. Boil the potatoes and peel and chop them while they are still warm. in a pan dry roast the peanuts till browned. Cool them and use a food processor to make a coarse powder. In a deep pan, heat the oil, temper it with cumin, curry leaves and green chillies. Fry for a few seconds, and add boiled and chopped potatoes. Fry the potatoes for about 2-3 minutes and tip in the Sabudana, peanuts mixture.. Mix well and cover the pan for a few seconds. You will see that the Sabudana has lost it's opaqueness and starting to become translucent. Keep mixing for about 5 minutes and the Sabudana Khichidi is ready. Switch off the stove and drizzle the lemon juice. Serve hot garnished with fresh coriander and a lemon wedge on the side.